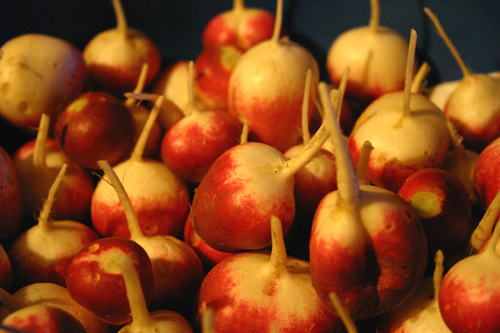 These radishes arrived today from my father’s little organic garden, to add some color to my hard and rainy spring days. Spring is the time of numerous awakenings, the time of change, the passage from ice to summer’s burning sun. Change is not always a bad thing, but I dislike change. I like things to stay the way they are, I like them to be palpably familiar. I need them to have some eternal, rock-solid shape and identity, so that I can cling to them in order not to be washed away by those mighty waves of anxiety. Sometimes I’m in desperate search of constants around me as there is nothing constant and unchanging about turmoils of my soul. But life isn’t based on universal things, it doesn’t stop to take the fixed shape we think it should have. It goes on, with us or without us, regardless whether we are ready or not. Yes, I’m scared of spring. And this is my today’s way to challenge that fear. Thank you very much, I’m so glad that you like it!